It bears repeating that New Orleans is unlike any other city in the world. 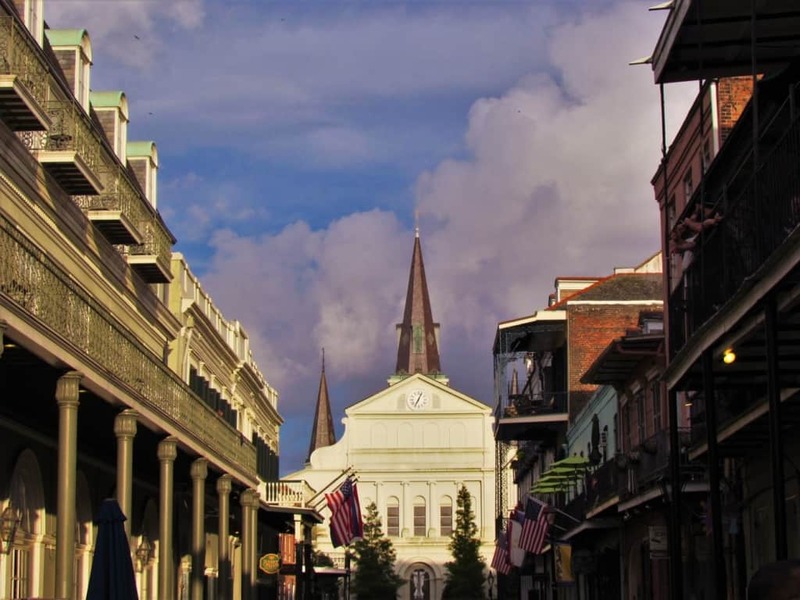 One of the biggest draws in The Big Easy is the French Quarter. In comprises just 78 square blocks, but in this small space are untold tales of wonder and amazement. It is filled with historic buildings constructed in the late 1700’s and early 1800’s. The French Quarter, or Old Square, is the oldest section of New Orleans. Founded in 1718, it has been home to troops, merchants, and even pirates. (You can read about one notable pirate here.) 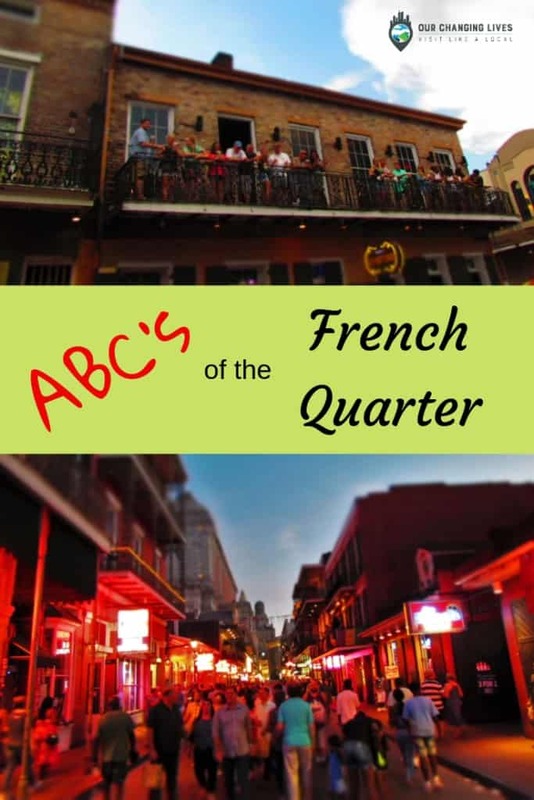 With so much to see and do, you will want to know the ABC’s of the French Quarter, before heading off on your own explorations. As you stroll through the French Quarter, don’t be surprised by the occasional voodoo shop. Voodoo was brought to New Orleans by the West African slaves in the early 1700’s. Many people associate the sticking of pins in dolls with voodoo, as a form of hexing a victim. This illusion has been fostered by Hollywood to capitalize off of the mystery of the religious rituals. While charms, potions, and amulets are a key part of voodoo, the base of their belief is founded in ancestor worship. A visit to the New Orleans Historic Voodoo Museum might be in the cards for you, if you wish to learn more. These days, a handful of shops offer up a variety of items to customers, with many geared toward tourists. The French Quarter has a mix of Spanish and French influences, which create an atmosphere that draws visitors from all around the globe. The area was greatly affected by fires in 1788 and again in 1794. Many structures were destroyed and replaced with the Creole Townhouses that line the streets and boulevards of the Quarter. These two, three, or even four-story structures hold businesses on the ground floor and homes above. The iron railings are a familiar feature in many pictures of the area. St. Louis Cathedral sits facing Jackson Square, but can be seen from many vantage points throughout the French Quarter. One of the most photographed buildings in America, it has been seen in hundreds of visual presentations. What would the French Quarter be without blocks and blocks of those iron rail balconies? As you wander the streets, it is easy to get distracted by the groups that assemble on the floors above. Many gather to mingle, while others are there to party. 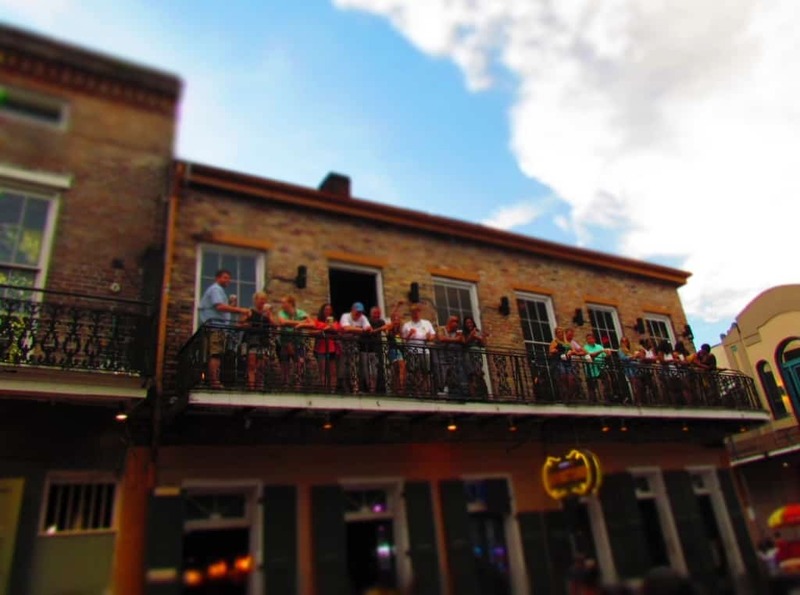 On Bourbon Street you will find establishments that offer customers the option of celebrating from one of these historic perches. If you are considering occupying one of these coveted spots during Mardi Gras, then you should be prepared to plan. These spaces can be reserved for more than a year in advance. Speaking of Mardi Gras makes us think of New Orleans intimate tie to music. Just about every style of tune can be heard wafting from a bar or nightclub in the French Quarter. Of course, as the video above shows, you can also be entertained by an impromptu Jazz parade. These are usually following a predetermined path that will lead the followers to a party destination. That doesn’t mean you can’t join in the march along the way. New Orleans is the perfect spot to drop a little of your inhibitions and just enjoy the moment. Those marching bands will usually lead their followers to one of the many bars or nightclubs found throughout the French Quarter. When most people think of partying in New Orleans they picture wandering in and out of the establishments on Bourbon Street. 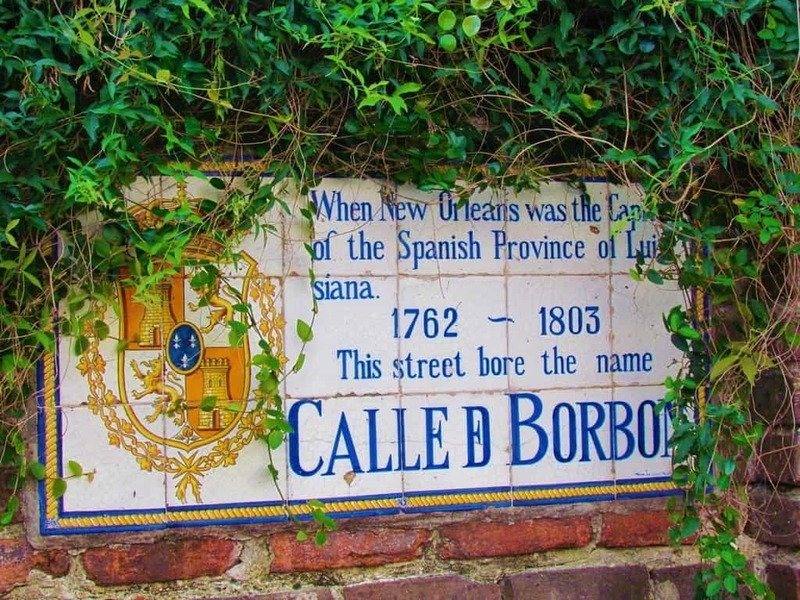 Named after one of France’s ruling families, (the House of Bourbon) many of the buildings on the street were part of the Spanish rebuilding after the fires. One of the few remaining structures is Lafitte’s Blacksmith Shop. Built in the 1770’s, it is the oldest surviving building in New Orleans. 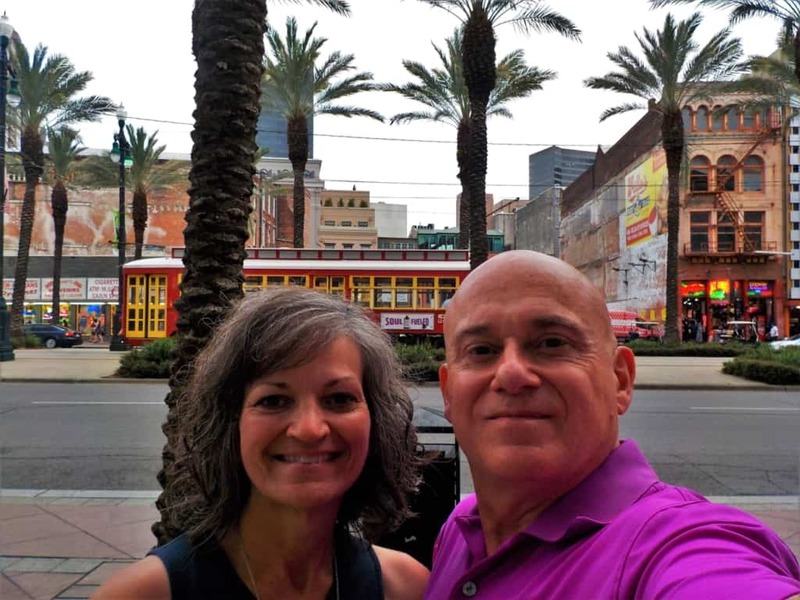 During the day, tourists wander Bourbon Street checking out the many souvenir shops that are interspersed between the restaurants and bars. As dark approaches, the crowds gather to watch the street come alive. Music escapes from the many nightclubs lining Bourbon Street. Neon lights illuminate the night, beckoning the crowds to come inside. A visit to the French Quarter will definitely allow plenty of opportunities to satisfy your sweet tooth. As we strolled the historic streets, we passed a variety of shops serving up all sorts of candies, cakes, and other desserts. New Orleans is home to the praline, which was brought here by the French settlers. This sweet confection is usually a combination of nuts, syrup or sugar, and some form of cream. The final product can be accented with a variety of flavors, but the base usually contains those three ingredients. The most common nut additions are pecans, almonds or hazelnuts. These delectable creations can have a creamy fudge-like texture or be on the crisper side. Visiting a local candy shop will usually include a taste test of their version of the praline, so it doesn’t take many stops to achieve a good sugar rush. Who knows, you may even catch them in the process of making a batch. In the days prior to paved streets, horse drawn carriages were the main mode of transportation. These days this unique form of travel is romanticized by the various carriage companies. Tourists can charter a 30 or 60 minute tour that highlights some of the historic sites located inside the French Quarter. There are even carriage ghost tours in the evenings. Besides being educational, it’s a romantic way to enjoy some time in this historic district. New Orleans draws in some interesting characters who will be seen all around the city. The French Quarter has more than its share, since it is a highly visited tourist district. Many costumed characters are working to advertise. Along Bourbon Street, you may spot one that is attempting to draw you into a show. Jackson Square is a gathering place for costumed characters looking to earn tips for photo opportunities. Even the small local bands will dress in outfits that help capture the attention of the passing crowds. With multiple zones, the French Quarter will be crowded in different areas throughout the day and night. Daylight hours will see an increase in the Jackson Square and shopping areas. Here tourists investigate the various shops looking for mementos and bargains. As the sun sets, the mood changes to one of relaxed fun. Restaurants draw lines of customers, while bars see a steady stream of people. The nightclubs fling open their doors to attract patrons with rifts of music. The heartbeat of the French Quarter continues until early in the morning, before the final party-goers make their way back to their lodging. 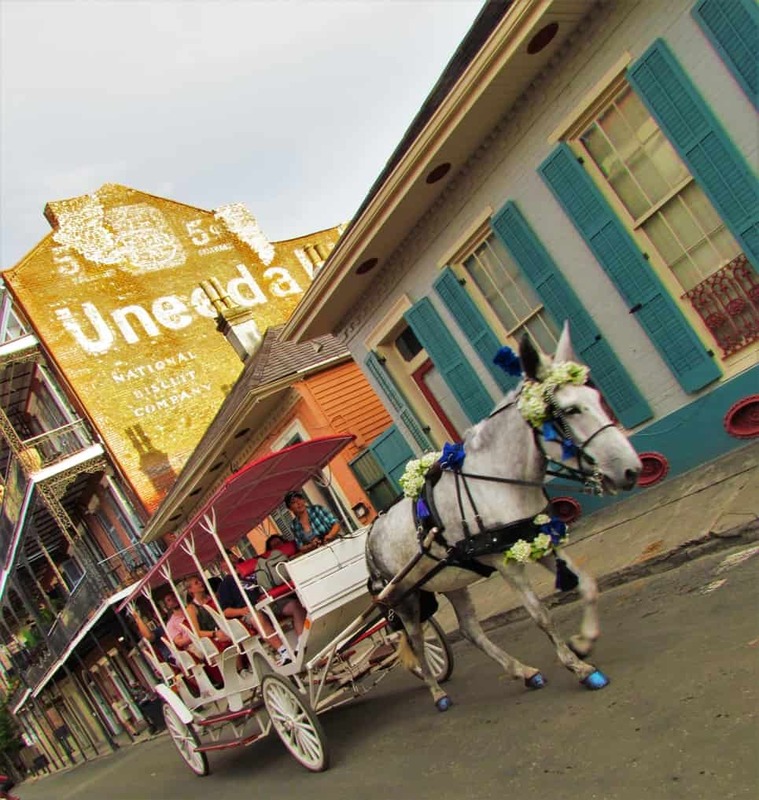 Visiting the French Quarter can be an exhilarating experience. Of course, those staying multiple days in New Orleans may do well to pace themselves. 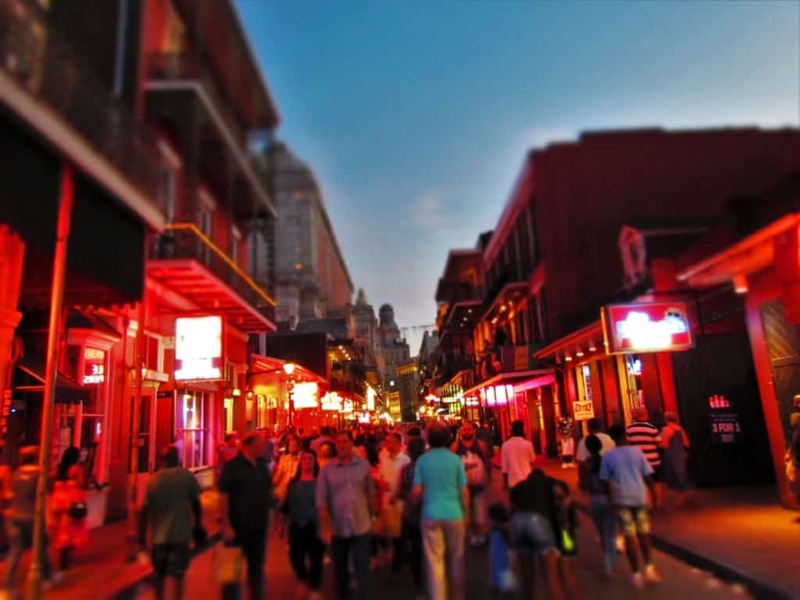 While it can be fun (and interesting) to party late into the night on Bourbon Street, you may also want to enjoy some of the quieter moments. A daybreak walk will allow you to enjoy the architecture without the crowds. Strolling to Cafe Du Monde in the morning will offer shorter waits for your beignets and coffee. (You can read more about Cafe Du Monde here.) These early morning excursions offer a view of a city that is a stark contrast to the pictures that most paint of The Big Easy. So what are your favorite things about the French Quarter?